I stumble over the name while buying a train ticket. 'One way to Derry, err Londonderry.' The ticket seller at Botanic Station in Belfast chuckles as he takes my money. 'Platform 1' he says. It isn't my first trip to Derry. In the summer of 1990, my cousin Tim and I took a bus there from nearby Ballymena where we had been visiting distant relatives. We explored the city, mainly from the relative safety of the famous walls that surround its old centre. There was barbwire everywhere and when we looked out over the famously republican Bogside neighborhood we saw smoke rising from an unseen fire and heard sirens. It may have just been a house fire but the rush of armoured vehicles and soldiers suggested otherwise. We wanted a photograph of the famous 'You Are Now Entering Free Derry' sign that had first appeared in 1969 as the civil rights movement was quickly giving way to the 'Troubles'. We made our way down from the old city, passing British soldiers on the way. We were two solidly built, long haired young men with faces that could have been — and had been, generations earlier — local. There were watching us very closely. I tried to smile at one of them reassuringly. He was about my age and when our eyes met I saw nothing but raw terror. Tim and I took our photos and retreated back into the old city for a pint. We asked the barman where we might see some music that evening and he laughed, ruefully. We were on the first bus out the next morning. This time I arrived two weeks before Christmas in the midst of what the locals were calling a 'heat wave'. Ten degrees with occasional drizzle isn't a heat wave in Sydney but I took the opportunity to walk the streets of a town that I barely recognised. The barbwire was gone, replaced by art galleries, theatres, and the appealing sounding Verbal Arts Centre. I had a plate of paella in front of the wondrous Guildhall and listened to the happy buzz of Christmas shoppers. It was difficult to believe that I was in the same city. Did I mention that my B&B was in the Bogside? To find it (after getting slightly lost) I had to pass by the very same Free Derry sign that Tim and I, as far as we were concerned, had taken a considerable risk to photograph. I looked at my map and discovered that my lodgings were just around the corner. This time I was more concerned about getting across the busy street than being mistaken for a paramilitary. One of my goals on my trip to Ireland, I decided, was to see either a band or a play every night. The folks at the B&B directed me to a flashy ticketing office just outside of the city walls. It appeared I had arrived at a good time. There was a play on that evening at the Playhouse Theatre involving three monologues by Jennifer Johnston. The following night's offering was equally appealing. The Undertones were playing. The members of the band that gave the world 'Teenage Kicks', John Peel's 'perfect song', are Derry natives. The concert was sold out but the ticket sellers seemed confident that they could find a ticket for me. After a few phone calls and some discussion, I was issued with one. They seemed eager for me to get to the concert. I was so surprised that I barely knew what to say. The play that night was subtle and disturbing. The monologues dealt with the 'Troubles' but the voices were so vivid and resonant that the impression left was more personal than political. It was also very poignant. As I walked out among the local theatre goers, it occurred to me that many of them likely had similar stories. The concert the following night was less subtle, of course, but equally moving as a glorious celebration of old school punk rock fun. I knew that live music had been a rare commodity in Derry when most of the crowd was in their early 20s. I found myself standing beside a former Derry Mod before the show. He had dusted off his fishtail parka for the evening. We chatted about music, clothes, kids, and life. When the band appeared he sang every word to every song and danced with utter joy. I understand, of course, that this didn't happen overnight and the wheels of change were turning even on my first visit. On my last day, I visited the Museum of Free Derry in the Bogside. As its name suggests, it presents a particular view of Derry's recent past. But the story is told in a compelling and moving manner that steers away from overtly republican messages while making it clear where the responsibility lies. It is often forgotten that the modern troubles were, in part, sparked by a basic lack of housing for the Catholic community in Derry. The museum traces the civil rights protests from their beginnings in the early '60s to the Bloody Sunday killings that changed the game so dramatically in 1972. As I was looking at the photographs of the terrible day, a man who worked at the museum stood beside me and asked if I recognised the building. I shook my head but looked again to realise that it was the museum itself. 'That was my brother,' he said, pointing to the badly injured young man in the photo. It was difficult to know how to respond. His brother had died ten feet from where we were standing. I asked if it wasn't difficult for him to come here. He smiled and said, 'No, it's okay', before wandering away and leaving me with tears in my eyes. 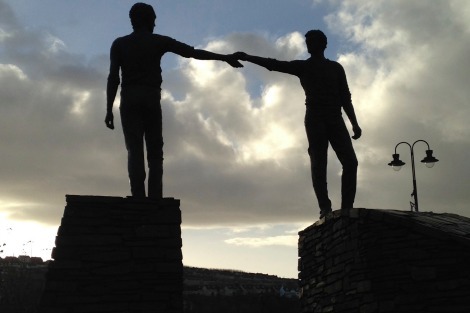 There is a sculpture at the city end of the main bridge that brings visitors into Derry. Two figures stand reaching towards each other with outstretched arms. Their hands are not quite touching but there is every indication that soon they will. There is, as the sculpture suggests, still some work to be done and some wounds that will be a long time in healing. Nevertheless, in the places where grim visaged war stubbornly refuses to unwrinkle its front, those who seek peace should find inspiration in a tough little town with two names and one big heart. "You Are Now Entering Free Derry (Palestine, Thailand, Sri Lanka, Afghanistan, Iraq.....No More Bloody Sundays)". It took the sincerity of the British government's sustained commitment to reform, and the even more constant support of the Irish Republic whose people opposed terrorist tactics over the long period of 'the troubles' to bring about change. Lovely, atmospheric piece. Thank you. In 1998 i had the opportunity of working in Northern Ireland. I was surprised at the extent to which I felt a sense of ‘homecoming’ , although I had not been there before. A forebear had left Ballymena for Australia in the 1870s, another step for a restless, dispossessed people, originally from Scotland. There were still plenty of signs of The Troubles in 1998: combat-kitted soldiers, armoured vehicles, fortified watch-houses, security checks. But the situation was lightening, and there was a sense of hope that some Irish form of ‘normal’ was within grasp. This article is a wonderful testament to healing and forgiveness. Northern Ireland has had a long and bloody history. Social injustice towards and discrimination against Catholics were the causes of the Troubles. I am hoping that the long and bitter sectarian hatred there will ultimately be forgiven as it appears to have been in Eire. Irish History is complex and some Catholics fail to realise that the United Irishmen were mainly Protestant. I remember a (real) Irish greeting: "Welcome to this country, sad and lovely as it is." There is much sadness to get over. Hopefully it will be. Is it true that Catholics refer to Derry and Protestants to Londonderry?